The nature of a fire creates special problems worthy of comprehensive treatment. Fire losses must be handled with special care since many types of materials can fuel a fire, causing soot fallout and smoke damage; also because large amounts of water are required to extinguish the blaze, thus introducing concerns of corrosion and mould and mildew growth. Insight Restoration has the trained personnel and equipment to handle all aspects of a fire loss, large or small. 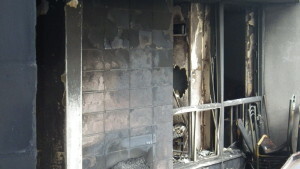 Remediating a Fire Loss After a fire or smoke damage occurs, a number of conditions need to be addressed immediately. Depending on the severity of the fire damage, debris removal is the first step in remediating a fire loss. Insight Restoration will conduct debris removal and some initial deodorization in order to gear up for the rest of the remediation project that will follow. Insight Restoration is prepared to handle the water and ensuing moisture that lingers after a fire is put out. Depending on the condition of the building after a fire, if it is safe to do so, a thorough dry down of the area will be initiated to prevent mold and mildew growth and prepare for the next step of the fire remediation and restoration. Fire damage restoration requires the utmost care and special handling. A range of materials and substances can fuel a fire, potentially causing heavy soot fallout and smoke damage. Also, the large amount of water used to extinguish a blaze introduces concerns of corrosion, mould and mildew growth. Insight Restoration employs a comprehensive approach when remediating a fire loss, with trained personnel and specialized equipment to handle all aspects of recovery – from the initial emergency through final reconstruction – as quickly as possible and with minimal disruption. We are equipped to handle full reconstruction of a burned-out building. As a key part of almost every recovery process, reconstruction is included under our umbrella of services. Our regional in-house cabinet shops handle all cabinetry and millwork jobs with skill and craftsmanship, and our team of in-house carpenters assist with installation and on-site finish work.